Designed to enhance the productivity of your ROBOCUT across an enormous range of applications, FANUC's range of dedicated software and hardware accessories give you the freedom to tailor your machining processes to your needs precisely. Like all FANUC products, FANUC accessories exhibit world-beating reliability, are simple to use and have been designed to help you get the most out of your ROBOCUT. 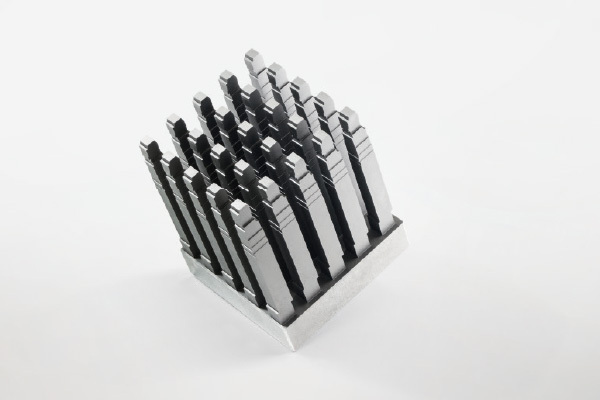 Using them will allow you to increase output and maintain exacting quality standards regardless of how challenging your machining processes might be. 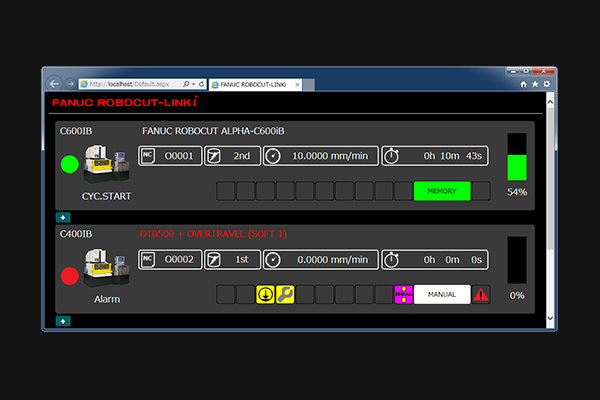 Equipped with a new graphic interface, Linki is an updated production and quality information management tool that allows you to remotely monitor up to 32 ROBOCUT machines in real time. User-friendly and intuitive, it gives you access to preventive maintenance functions as well as consumable and repair services. 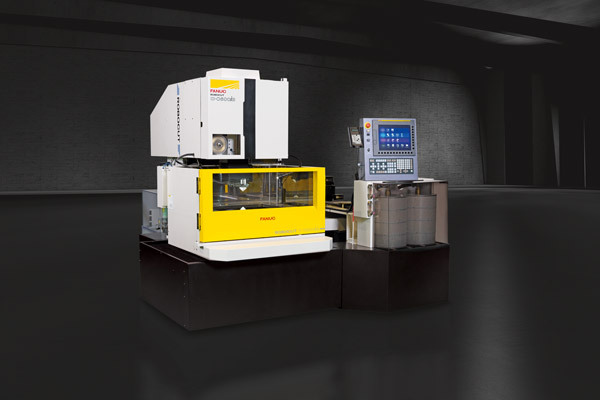 FANUC's i-Pulse performance generator optimises wire cut processes across a number of functions by automatically selecting the appropriate machining technology, enabling increased precision in critical areas, maximising cutting speed while minimising the risk of wire breaks and providing ultimate surfaces. 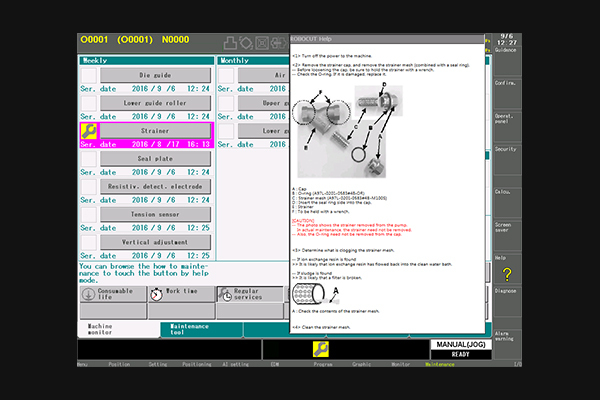 The intuitive visual maintenance interface on FANUC’s 31i-WB CNC facilitates faster recoveries after servicing. The integrated early warning system identifies errors before they occur, ensuring maximum precision and consistent quality standards. A statistical diagnostic tool that is used to monitor the reliability and performances of AWF main functions (wire threading and cutting) as well as to investigate the causes of wire breakages during machining. All events are recorded and presented in form of histograms (frequency of events at a certain wire position). A simple but very handy function to find part numbers of most common spare parts. The FANUC ROBOCUT CAMi system makes programming cylindrical, conical and 4-axis machining routines easy. 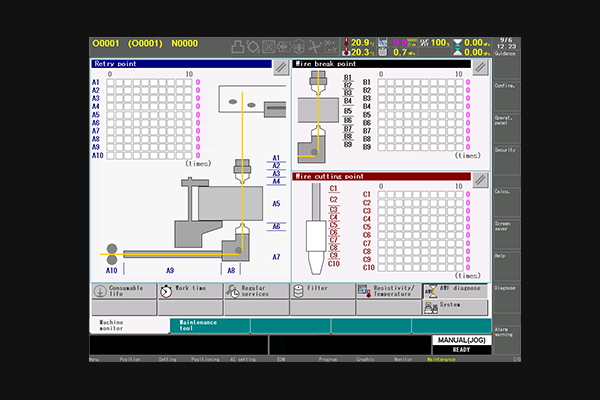 You can mirror CAMi software directly to the CNC screen by using the remote desktop function. 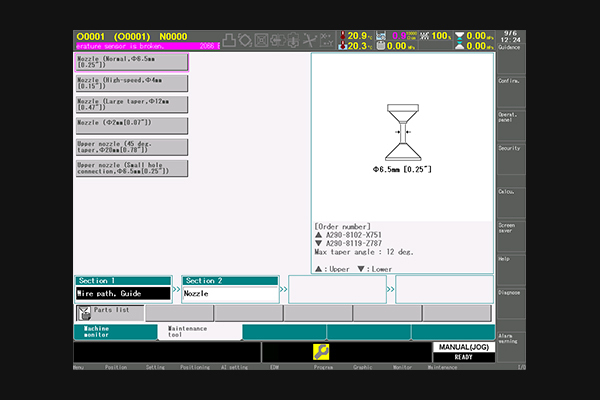 CAMi also offers multiple languages and a number of 2D or 3D data import options such as DXF, IGES and STEP files. To ensure faster error-free setup, FANUC Auto 3D software measures inclination and rotation on the workpiece with touch probe automatic compensation of the program plane and each axis movement - without the need for an additional 3D measuring machine and server (PC). Not requiring an additional external control, these axes are directly programmable from the ROBOCUT CNC. Cost effective and easy to use, they offer seamless communication, reliability and increased productivity. 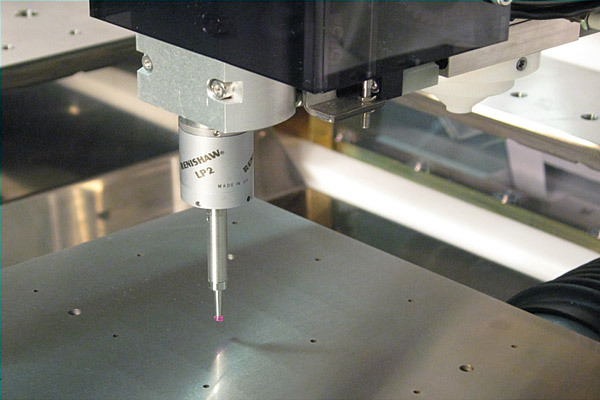 ROBOCUT is available with a CCR rotary table. 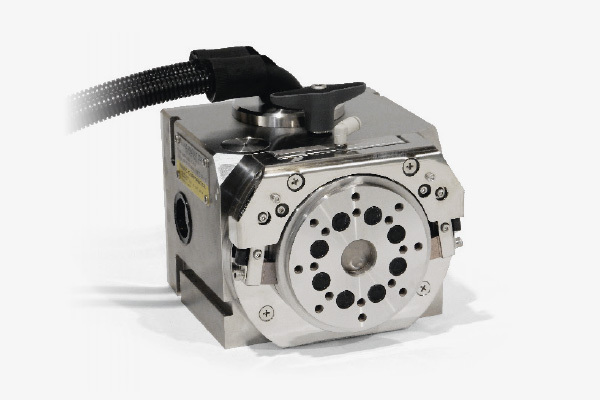 This lightweight universal rotary table comes with high-resolution glass scales and, for maximum concentricity, provides optimum travel between the U and V axes. Powered by FANUC's partner GTR, ProfDia© software tool makes setting up 5 axis programs and PCD tool cutting easy. From entering the contour to setting rotary and fixed tools, programming is completed in just a few steps. ProfDia© also calculates the EDM path automatically, sending this straight to the machine and allowing you to begin cutting immediately. Save time setting up 5 axis programs and take the headache out of PCD tool cutting with GTR ProfDia©. 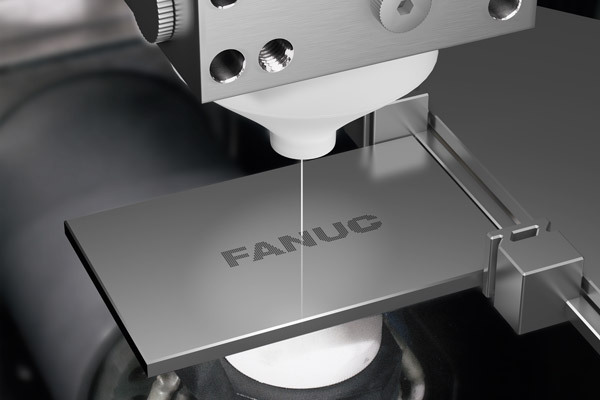 FANUC's micro finish generator not only enables you to achieve extremely fine surfaces and mirror finishes but also ensures maximum accuracy and efficient cutting. For ultra accurate machining, FANUC thin-wire technology enables you to cut with wires down to diameters of 0.05 mm. Available on the ROBOCUT C400iA, this option comes with process-secure threading and is ideal for applications demanding micro-machining.